The DVD contains many other examples with arrangements. The best route to the Chet Style on the internet! 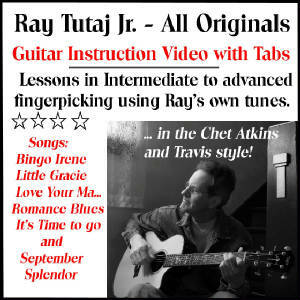 Ray's newest lesson DVD is this one below. If you have the one above, you will surely enjoy "Ray's Originals" guitar lessons. The fingerpicking patterns here below are from the RIght Hand fIngerpicking DVD at top of page. On the DVD Ray plays each pattern individually for you and helps you with other aspects of this style.